Now then where do I re-begin? Ah yes, it was MOT time around October (2002), a week to go. I wanted the car on road, even if it was winter. So the car had nearly everything new, mechanically anyway, so what could go wrong? I gave it another polish (An army saying - bulls**t baffles brains) and checked the car over, such as lights, emissions, brakes and a final check for any rust - no nothing. I was confident the car would pass. I drove the car to Bath for it MOT. Ahhh! it failed on lights, brakes and emissions. I drove off not in the best of moods. I didn't even go back to work knowing that heartless jibes awaited me - they're only jealous anyway! So it was rebooked for the following week and I was determined to make it pass. I stripped the carburettors and re-set them and I even bought a Gas Analyser to check the emission levels - one task out of the way. As for the lights, yes you guessed it one of the light motors was a bit sticky. Out it came for a dam good clean up. In it went and again and again and again. Eventually, it went in to my satisfaction and now works, a milli-second after the other light - but at least it works! As for the back brakes, I put my hand up, it was my fault, after I put the new brake shoes in I never connected them up properly - what a wally! So the car is now ready - MOT man do your worst! Anyway, I drove the car to Bath for its re-check. As I pulled in the test centre the MoT man just smirked. I in turn smirked back, he then sneared [I'm getting images of "The Good, The Bad & The Ugly" - Ed]. Anyway the offending failures were subsequently checked and …… Of course it passed! I was now free to drive the UK's roads, top down - but it's winter I hear you say - okay top down a bit then. I was now the very proud owner of a gleaming bright red DHC TR7 with a MOT and lots of new shiny bits. To celebrate, I drove the car to work and much gasping took place from colleagues. "Yes" I said, "laugh on now", it had become a much-admired car and a topic of conversation over many a coffee. So that was October. Since that time, me being a man with a very low boredom threshold, I decided to improve the car by giving the engine a jolly good de-coking. I bought a new head and rocker gasket for the occasion and subsequently removed the head - Ha! That's a tale in itself - all I will say is bl***y head bolts - know what I mean?. To cut a very long story short the head came off and was surprisingly in good condition very little carbonisation. As the car only had, at the time, 98k on the clock, I thought perhaps this might have been its first de-coke - maybe it was who knows, there's nothing in it service history to suggest otherwise. After flicking through the pages of a well-known supplier of parts, I decided that a new timing chain and tensioner was in order, due to the low cost. It was time to put the engine back together, not before however, I check the big ends. Off came the sump and well all I can say was that I didn't need to spend any more money. Time to tackle the head. On went the gasket, on went the head - anyone who has done this job will know about and understand the annoying problem off lining up the inlet manifold to block coolant union, and its small rubber sealant ring - enough said! The head eventually went back on and the carburettors back connected up. What a transformation, the car actually drove like a sports car albeit a TR7. Since that time I've been happily driving the car to work daily and since the summer has manifested itself I've had the hood down most days. I still get the odd remark, like "I used to have one of those" and we would give each other a knowing smile. Other remarks I still get is "you don't see many of those now a days", to which I reply - "thank god!" I'm coming to the end of my tale, "hooray", I hear you say. I'm about to turn 40 in October and any reader who has reached that age will know what this means. It means a new bright red sports car is needed to subdue those impending feelings. A young minded man at 40 cannot be seen in a classic car, as people will think he has a flat cap and smokes a pipe - Um that comes later apparently. So to that end, I NEED a bright red Porsche 944! 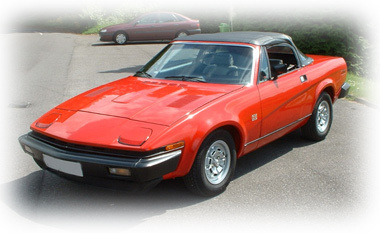 [choke, chole, splutter, "heretic" - Ed] To make that happen my wife tells me my TR7 has to go first, so to that end does anyone want to continue the tale …?